Many people feel tattoos should have meaning while others think there’s no need for significance as long as the wearer likes it. Beyond the ancient process of tattooing the design itself can be a signal of massive change for the wearer. Tattoos often mean a turning point or change that has affected the person so that they are no longer the person they were before – their very soul is changed. The thing is there’s so many things out there that offer to help us find that path or make that massive change. How can you tell which is true and which is BS? For many people choosing the right path, and being terrified of the wrong one can leave them feeling in limbo. A poem by Tomas Transtromer titled The Blue House explains that we are just living one life of many. We know all the other routes but ultimately we have to make a choice to decide which of the many lives we will lead. A choice we make, a path we don’t take. Hidden away in Minka Brooklyn is a small studio used by a variety of artists. 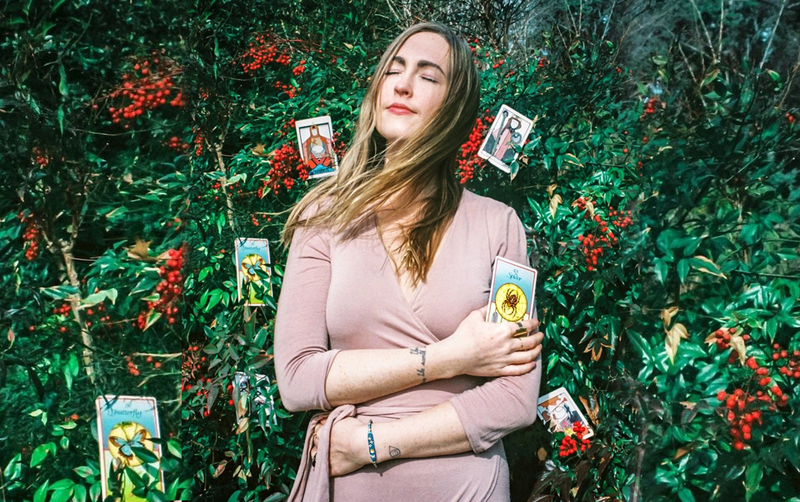 It’s very new age, there’s acupuncturists, Ayurveda massages, sound healing, yoga, and a tattoo artist specializing in stick poke designs relating to tarot readings. It all sounds very new age and very much like it’s just another way for the Millenial to “find themselves”, yet what the artist offers is unique. Ashley Glynn, the owner, uses a Tarot pack to do a reading for her clients before tattooing them with a design of her creation and choice. Tarot cards have been used for centuries by seers, gypsies, wise women, and witches to help determine clues about the past, present, and future. This deck has suits just like a regular deck, picture cards, and multiple meanings depending on how the cards are displayed. For believers, they stand at a crossroads, unsure of which path they should choose, and just want the reassurance that a tarot reading can provide. What Ashley Glynn does is provide that reassurance, but she also gives clients a permanent reminder, a permanent marking, or their commitment to that path. The session begins with intentions and setting those in motion with the energy of the universe. She smudges the space using sage to purify the air and bids her clients to focus on their intention and what they want to manifest. Most people have doubts and concerns so the reading will be done several times to practice until the client is comfortable. The reading will then show the client the path they need and give them insight before Ashley discusses designs. The design can be any number of illustrations in Ashley’s sample book, but it will be changed to relate to the reading and the person themselves. The design will have many different elements put together to represent the wearer and their path. Unlike most artists Ashley does her work with the old stick and poke method so designs take a long time to do and are usually very simple. Once they are finished the client is on their way with instructions to think about the experience so that they can find the right path.